Anyone ever discovered a picture of the famous Nat Hickey? I've found a couple Original Celtics photos but didn't know which one he'd be. I sent you a pic of Hickey since I do not know how to post images here. Can anyone explain the image posting process? Thank you! Wow ... love the picture of these old uniforms.Thanks again. 4) right click to get a short menu; click on "Copy Image Location"
7) 'Submit' button creates your post, and the actual image appears within. The pic I have is not available online. How do I post the image? If you can upload from your computer to, say, your Facebook page -- or any online photo storage, I'd think -- then right-click on your picture and continue from 'Copy Image Location'. The easiest image-hosting website to use is http://imageshack.us/. After you upload your image, you'll be given a direct link that you can post here. Thanks for the tip. I have posted a link (below). Did I do this right, James? Nice picture, by the way! A player known only as HR ? Is Dave Kerr related to Johnny or Steve Kerr? "HR" would be John "Honey" Russell. I believe the picture may come from the biography of Russell (Honey Russell: Between Games, Between Halves). The caption with the bottom photo is pretty funny. I guess the writer or editor just doesn't know basketball. Hickey isn't going high, and he isn't blocking any shot. A shooter isn't 'backed up' by a teammate. This is obviously a rebound, one that bounced out beyond Hickey. Van Breda Kolff went up for it but deferred to Kuka. In both pictures, the Knicks are wearing hot pants, while Hickey's shorts are relatively baggy. About the size of Stockton's in the '00s. I don't know how common this photo is, but recently ran across this in the January 5, 1941 Lexington (KY) Herald-Leader. 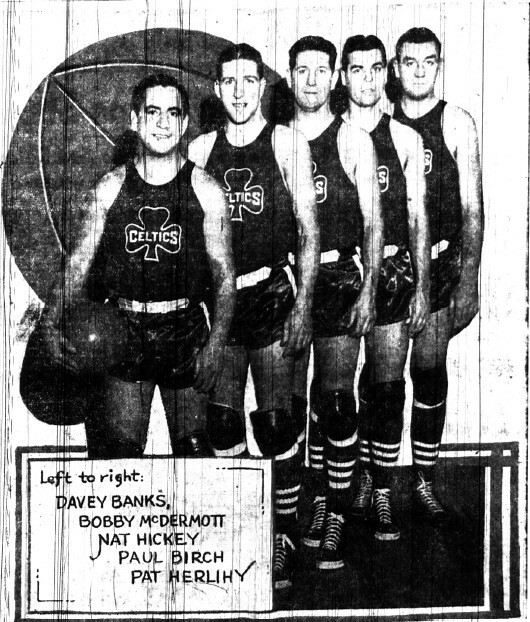 It accompanied the preview of a game held in Lexington between the Original Celtics and a team from Louisville called the Edentide club. Edentide apparently was composed of former collegians, including UK players Layton Rouse and Warfield Donohue. The game was for charity promoted by the Lexington Lions Club. 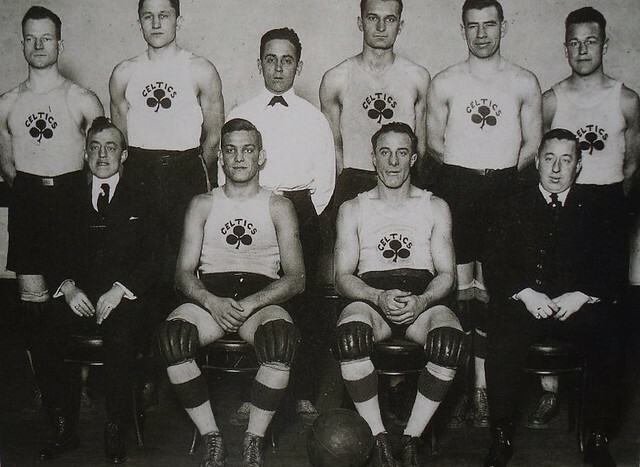 The Celtics agreed to only take expenses for the game, at the request of Adolph Rupp. According to the article Rupp was "largely responsible for urging the Celtics to appear here. Rupp said he thought the hundreds of basketball maniacs in this region would be interested in watching the best team in the world." Edentide ended up winning the game 44-41. Bobby McDermott, who had been banged up earlier in a game against the Kautsky's did not play. According to the post-game article he was treated by UK's trainer Frank "Skipper" Mann but was not good enough to go. McDermott's replacement was Ash Resnick which the paper described as "a bruiser who played once upon a time for New York University, and is no dream player." High scorer for the Celtics was Nat HIckey with 20 points on 10 field goals. Paul Birch added 14 points. High scorer for Edentide was Harry Blandford with 16 points. According to the article "The Celtics apologized in the dressing room after the contest for not being more clever. 'You can be funny when you're way out in front.' said Banks, 'but we were behind all night and we didn't feel funny. Next time don't get us such a tough team.'" If anyone know any details about this, let me know. in the photo from top left, we see the New York Original Celtics in the 1921 season: Johnny Whitty, Dutch Dehnert, the referee Connolly, Joe Trippe, Pete Barry, Mike Smolick; sitting from left the owner Jim Furey, captain Ernie Reich, Johnny Beckman, the co-owner Tom Furey. Contact me at roberto.bergogni@fastpiu.it for any further info.